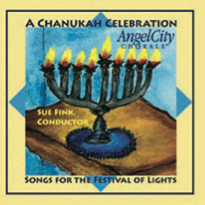 Angel City Chorale has put together an extraordinary collection of Chanukah songs, both beloved traditional favorites and exciting original pieces, to light up your holidays with their boundless joy, poignant beauty, playful humor, and timeless magic. ACC has brought all of the wonderful spontaneity, energy and effervescence with which we perform live to this unique CD. This remarkable music will make your Chanukah celebration complete and kindle the warmth of the holiday in your heart as you light your candles for years to come.